The Mercure les Deux Alpes team is delighted to welcome you to the Massif des Écrins! Enjoy our convenient location at the foot of the slopes and discover the Les Deux Alpes pistes and glacier, at 11,880 feet (3600 m) of altitude. At the heart of the Les Deux Alpes 1800 ski resort, accessible from Grenoble TGV train station and at the foot of the ski slopes, the 4-star Mercure Les 2 Alpes 1800 hotel offers spacious rooms with a balcony and exceptional views over the resort. After a day of work or sport, relax by the pool at a special rate. Enjoy a moment of peace to relax on our restaurant's panoramic terrace. "Glacier and Snowpark" ski area and hotel reopening June 23 to September 1, 2018. Take a moment to relax in our comfortable, spacious rooms boasting a balcony - most of which are south-facing - and an exceptional panoramic view. You can also enjoy free WIFI, tea and coffee making facilities and a flat-screen TV. For your comfort, you can choose from 2 types of room: a Standard Room with a view of the Oisans region; or a Superior Room, which is larger and has a balcony and views of the resort and the Roche de la Muzelle peak. Some can accommodate up to 5 people. 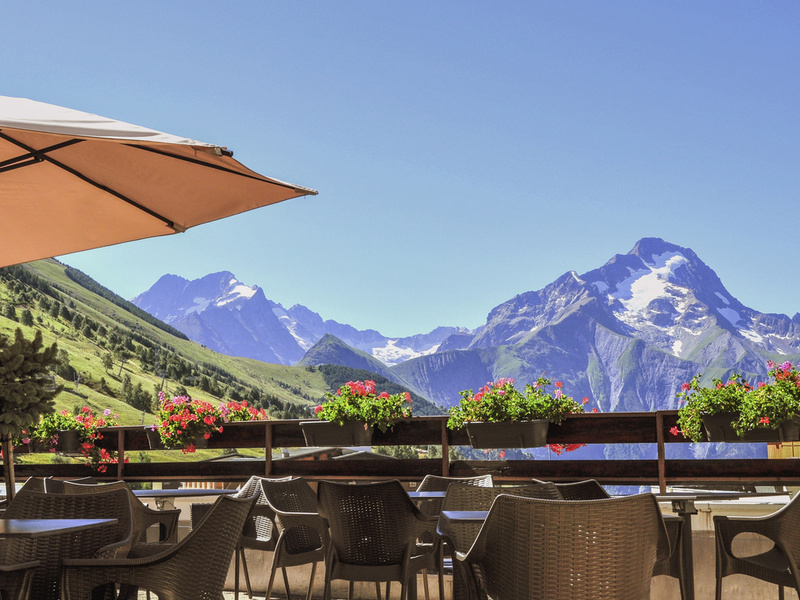 The Les Ecrins restaurant serves varied traditional and local cuisine, as well as themed buffets (with a supplement for Savoy fondue, pierrade dishes and raclette). Specialty local dishes can be reserved every day. This spacious bar with solarium and fireplace invites you to warm up with a hot drink and a crepe after skiing or unwind with friends around a cocktail or glass of wine.